Listen to our professional marimba players throughout lunch time as they play Mexican Classics and modern music. Come join the fun and play Marimba with them. 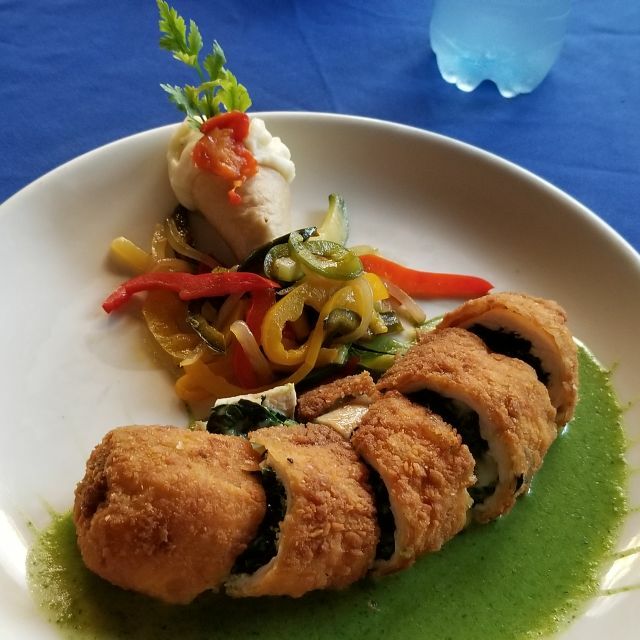 Extraordinary Mexican food and awesome Margaritas are served graciously at the lush patio of one of Cozumel"s most beautiful colonial buildings, amidst splashing fountains and tasteful décor. When you visit Pancho's Backyard don't forget to bring your camera! Live Marimba music during lunch. This was our fourth visit to Pancho's, and we loved our food, the music and the atmosphere. I have taken my customers there to experience the delightful live music, and the margarita's as well as the food. This time I tried the Strawberry Margarita, my husband had the traditional. Our fresh salsa was simply made, and the flavors were so tasty. We shared the combination meal, chicken, enchilada, beans, rice, quesadilla and of course we ordered the fresh salsa and guacamole with the fresh homemade nacho chips. The waiter was friendly, and efficient. We will return again, the next time we are in Cozumel. Everything was great. Creative presentations. No complaints. Very good all round! Second time here and we love it. Great service, very tasty food and quality margaritas. We will be back! This restaurant was recommended by a friend and it lived up to its hype. Great food and margarita’s. Orlando was our waiter and he was very friendly and quick. Great place, highly recommended! Was a last minute decision to go out, and it was the perfect night. All around a great place for a meal with the people you love. This was my second time visiting Pancho’s in Cozumel. We chose to visit the location which was an easy taxi trip about 3 miles from our cruise ship, which was not crowded at all. The ambience was perfect and the food and drinks were great and very affordable. There are also some very nice shops near the restaurant. This all made for a very nice day in Mexico! Waiter was very nice and personable. Food took a little long but the staff very attentive. Great food, amazing espresso. I recommend if you’re in town visiting. Food was good, service was a little slow. I’m only going back to buy a T-shirt. Best margaritas and food for an amazing value! We had a really wonderful dinner here. The service was great. We loved the ambience and would definitely come back the next time we are in Cozumel! So many positive words to say but all adds up to Amazing! I also have it 5 stars in Yelp! Great Margaritas, mex food!!! Live music Fun place. 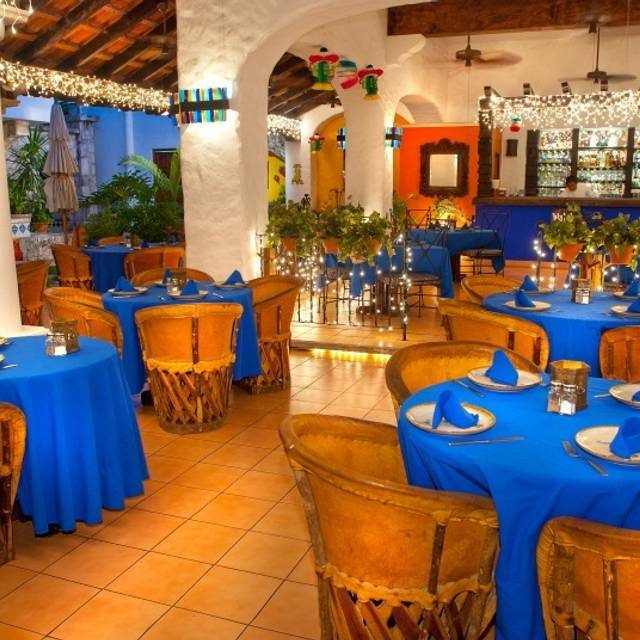 Despite the ineloquent name, Panchos has our favorite upscale restaurant in Cozumel. We have been many, many times. One time we stayed in La Playa instead of Cozumel and we rode the ferry both ways over and back just to eat there. Very highly recommended. This month we had a dinner for 14 people as part of our having a family marriage on the island. Everyone loved the place. Great food, great service. Love the courtyard area. Visiting Cozumel and went by for dinner on recommendation of a friend, place is very intimate and quiet which made for a wonderful romantic dinner on vacation. A must try! Although the service was friendly, would definitely not return. Very overpriced for quality of product served. Been going here for 20 years and it is still every bit as good!!! Booked this for a small group birthday celebration. Great service, and they brought a birthday dessert for us and "photo op" display for the occasion! The filet was excellent, cooked perfectly. The fish dish was served impressively, and was tasty, though the sauce was not the one asked for. We love this place. Went to Cozumel on a cruise 8 years ago and found this place, so when we went on a cruise with our kids last week, remembered this place and ate here again and it did not disappoint. Just as we remembered it... great guacamole and chips, strong margaritas, fantastic tacos and quesadillas! We will eat here anytime we are in Cozumel! We were seated promptly in a very scenic garden like area. Did inks were served and very good. Our meals were awesome! Carne Asada enchilada and tamale! Muey bueno! This was our thirteenth visit to Panchos! We absolutely love this place. We would not miss it while visiting Cozumel. GREAT atmosphere, entertainment, service, food and of course those Margaritas!!! I have been vacationing in Cozumel for the last five years, and every year we go to Poncho’s Backyard for dinner. The service, food, and atmosphere are exceptional!!! Fantastic!! Good food in a lovely setting with attentive staff. We had a great meal at Poncho's in Cozumel. Very nice to make a reservation through Open Table. Can't go wrong with this choice. Went when on a cruise stop, and restaurant was recommended by a friend. Had a great meal there and super good (strong) margaritas! Menu was pretty limited though. : ( Just has a nice ambiance with couple playing music (although I understand they have been there forever and play the same things over and over!) Really cute though. Outdoor patio is nice, relaxing and a good getaway from the ship. You have to walk through their shops to get to the outdoor restaurant, but the sales clerks don't bother you a bit, like they do on the streets, which is also nice. Came on a cruise and wanted a fancy place with calm ambience. It’s perfect. Lunch in a garden with lovely live music. Four of us, good food and one drink each was $US 80. When searching for a place to dine on our last night in Cozumel great reviews convinced us to try Panchos Backyard. Our experience exceeded expectations. Service was quick with attention to detail. Beautiful decor with a romantic setting. Highly recommend for any occasion. I arrived quite a bit early, but was seated immediately. There were three ships in port at the same time, but Pancho's was not crowded. I got a great table with a harbor view. I had two appetizers (tamales and guacamole) and each were among the best I ever had. I also had a margarita which was excellent. Although Pancho's is in the 'tourist trap' zone (walking distance from ships, the prices were reasonable; highly recommend Pancho's. This was our 12th. visit to Panchos Backyard. We never miss dining and drinking there when we are in Port. Great food and awesome margaritas!!! We will be returning in March for our 13th. visit!!! To be fair it was New Years and many ships were at port but our server made it a poor experience for our family! Dinner on Xmas eve was excellent. Nice courtyard and well kept. All 5 of us enjoyed food and drinks. Reasonably priced. Good service, although the waiter kind of disappeared when we wanted the check, which I find is kind of typical in Mexico. Started asking for check after last item was delivered for rest of stay in Cozumel which helped a lot. Top notch experience. Our server was outstanding and our food was beyond delicious! We have heard a lot about Pancho's and tried it while on a cruise. The guacamole was excellent, the nacho's and the quesadillas were huge and filled with lots of chicken and cheese.....enough to satisfy two of us. Great place for any occasion. Excellent service. Beautiful place, great food, and friendly, spot on service (Fernando was an amazing host for us). I'd go back every night for a week!